They say you never forget your first… and that’s as true of cruise ships as it is loves. For me, the Norwegian Breakaway was the one who introduced me to the joys of cruising and so, like a lot of others who have gotten used to having her homeported in New York City, I’m feeling a little melancholy. Because this week, she’ll be leaving New York City to sail out of ports ranging from Miami to Copenhagen, New Orleans to Berlin. In other words, our girl is getting ready to go out and see the world. Sure, like any excited young world traveler, she’ll come home every now and again. But it’s important that all those places the Breakaway will soon be visiting know one very important thing: She is a New York City ship, and always will be. You can take the ship out of New York City, but you can’t take the New York City out of the ship. Heck, all anyone has to do is look at that big, beautiful hull. Some girls wear their hearts on their sleeve. The Breakaway wears her home town on her hull, where the sun will always shine over the New York City skyline painted by world-renowned artist Peter Max. And while her trips past the Statue of Liberty may be fewer and farther between, she will take her image of that iconic New York City landmark with her wherever she may go. The Breakaway will take a little bit of New York City with her! Those of us whom the Breakaway leaves behind will, of course, move on. I’d be lying if I didn’t admit to being excited about my first sailing on her sister ship, the Norwegian Escape, which will now begin sailing out of New York City. How could I not be tempted by the ship’s waterfall-filled grotto and new-to-me dining venues? I’m only human! 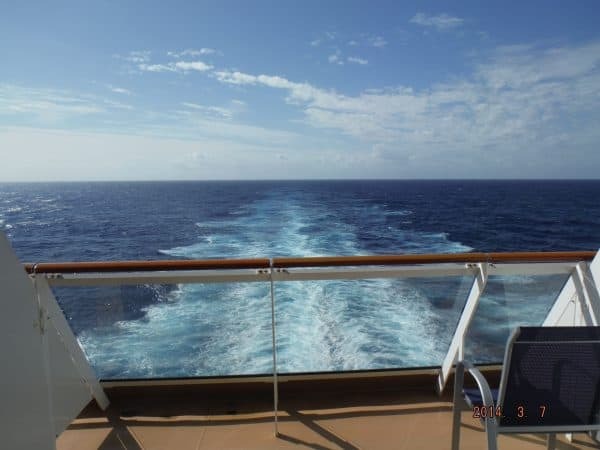 But the Breakaway will always be the ship which proved to me that the Caribbean waters really are the kind of blue no Instagram filter can fake. And she’ll always be the first ship on which I danced under the stars in the middle of the open sea. Aft-facing balcony 12902 will forever be the place on which I discovered the simply pleasure of staring endlessly at a ship’s wake, and the ropes course will be where I learned… well, nothing, because on five different Breakaway sailings, I vowed to overcome my fears but never actually did. Thanks to this aft-facing balcony, my first stateroom was a room with a view. Which means, of course, that when eventually the Breakaway comes back home, like a wayward child who has a series of adventures before moving back into mom and dad’s basement, I’ll be here, waiting, ready to fall in love all over again. Or at least conquer that dang ropes course. Meanwhile, enjoy this amazing video fellow Breakaway fan Robbie O’Malley created as his way of saying farewell — at least for now — to the popular ship! Have you sailed the Breakaway out of New York City? Or perhaps you’re looking forward to sailing the ship from another port?